29 Dec, 2017 This is not a post I ever wanted to write but it’s time to tie up loose ends before starting the new year. I’ve left DiEM25 and I’d like to explain to you why that is and what I hope DiEM will do differently in the future if it is to realise its tremendous potential to be a force for good in the world. DiEM25 has a wonderful community of amazing, optimistic, and progressive people who want to make the world a kinder, more sustainable, and fairer place. As of today, I am no longer a member of DiEM25. This is a decision that I take with a heavy heart and in no way lightly. I joined DiEM because of my utmost respect for Yanis and how he handled himself during the Greek crisis. I still hold him in the highest esteem. I’m probably not alone in this. What I found at DiEM, however, was much more than the already-formidable and inspirational Yanis. I found a wonderful community of amazing, optimistic, and progressive people. People who want to make the world a kinder, more sustainable, and fairer place. Gentle, caring, and yet fiercely determined souls that I’m forever grateful to have had the opportunity to meet. (You know who you are, I’m not going to list you all). I joined DiEM because it was (is?) the only progressive pan-European political movement I could find. DiEM’s goal is to represent an alternative to the disastrous dichotomy of the nationalist international and neoliberalism. The former is what you know from Brexit and Trump. The latter is the architect of the decades of relentless, widening inequality that gave us Brexit and Trump. DiEM’s third way is to inspire a progressive international. So, instead of leaving the EU, for example, staying in but working to democratise it. Needless to say, I wholeheartedly believe in that mission. DiEM’s approach is also pragmatic: instead of just whining about things, propose alternatives! In DiEM’s case, these alternatives are progressive policies that constitute a Progressive Agenda for Europe. No other political movement I can see checks all the boxes like DiEM does. DiEM has the right scope, approach, and values. In other words, it is Pan-European, practices constructive disobedience, and subscribes to progressive values, including intersectional feminism. However, it was heartbreaking to experience that DiEM25 – at least today – does not practice what it preaches internally. I approached DiEM not only because of my admiration of Yanis but also because I saw something lacking that I could help with. That thing was a focus on progressive technology. If we’re taking on neoliberalism, we are taking on surveillance capitalism. So we’re taking on the centralised technology of Silicon Valley. The way we do that is to fund and encourage the creation of ethical technologies. That’s why I approached DiEM with my proposal to add a 7th pillar for the Progressive Agenda for Europe: an Internet of People. The goal of the 7th pillar is to draft policies encouraging decentralised technology funded from the commons. I use the term ‘decentralised technology’ here in its broadest sense. That is, to mean technology that’s topologically decentralised, free and open, and interoperable. Technology that empowers individuals over centralised power structures like governments and corporations. Technology that enables people to communicate directly with each other. Technology that empowers individuals to spontaneously organise and express their political will. Technology that safeguards the integrity of personhood and thereby forms the minimum prerequisite for any sort of meaningful social contract and democracy in the digital age. These are technologies that we, ourselves, need to realise and amplify our efforts to create a decentralised, democratic Europe. A Europe – and a world – based on individual sovereignty and a healthy commons. The proposal and the policy ideas for the Internet of People pillar were enthusiastically welcomed. Unfortunately, implementing them internally at DiEM wasn't. We cannot preach one thing and practice another. DiEM cannot preach openness and transparency and democracy for everyone else but shy away from it itself. Sadly, this is what I see happening. And to be perfectly frank, I think it comes out of fear. Fear of making mistakes. Fear of loss of control. Fear of enemy action. Fear of public criticism. All, quite possibly, valid fears. But all fears that will kill this movement dead faster than the worst efforts of even its most determined adversaries. 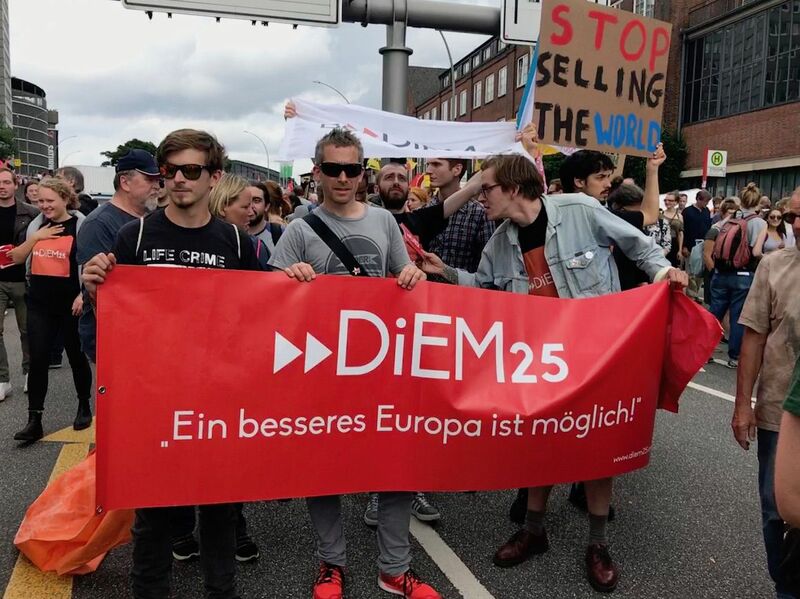 If DiEM25 is to realise its tremendous potential to be a force for good in the world and succeed in its mission to democratise Europe, it must first democratise itself. A democratic future, in the age of the Internet, is a decentralised future. If a centralised organisation like DiEM wants to realise this mission, then it must act as a bridge to help build the necessary decentralised infrastructure that will, eventually, make centralised institutions (including itself) irrelevant. To put it simply: its core tenet must be to exist to eventually not exist. Here, then, as an ex-member of the DiEM Advisory Committee, and as a founder of the 7th pillar, are my parting words of advice. We cannot preach free and open source in the 7th pillar and then keep all our own source code, including the source code of the voting systems used internally, closed. Yet we do. All DiEM source code should be publicly-available under a free and open source license. Ideally, the code should be hosted on DiEM’s own source code repository – e.g., Gitea or GitLab – that is then published to GitHub. Having the code open would make it easier for others to contribute to the projects. And, while it’s no guarantee, possible security issues could also come to light and be fixed easier. It would also mean that third-parties could audit bits of the code – like the internal voting systems – which are currently entirely opaque. When I recently brought this up in an email thread that I was added into, the same member of the CC asked me if I have “a religious fervour to have everything open.” My response to which is: Yes, I do want everything to be free/open and in the commons. That’s a core tenet of the 7th pillar. That isn’t religious fervour, it’s the design of technology that is necessary for a post-capitalist/post-neoliberal world. We cannot preach the evils of surveillance capitalism in the 7th pillar and yet keep using its wares when ethical alternatives exist. Yet we do. DiEM25 must use decentralised infrastructure whenever it exists and encourage the development of new decentalised platforms whenever possible. I set up our own “Twitter” – a Mastodon instance – for DiEM at d25.community (now closed) and it was rejected by the CC. It was a space where all members had the opportunity to reach and talk to all other members. The closest thing DiEM has to this at the moment is a closed, invitation-only Facebook group and its online forums, which are notoriously difficult to use and thus mostly ignored. We could have used d25.community as our primary means of communication and then published to Facebook, Twitter, etc., when we wanted to reach a wider audience. This is what the IndieWeb folks call POSSE: Publish (on your) Own Site, Syndicate Elsewhere. We must use the existing systems if we want to reach a mainstream audience today but we don't have to use them as our primary tools. The canonical location of our communication must be platforms that we own and control. 3. Let the people speak! We cannot preach decentralisation and open communication in the 7th pillar and then keep DiEM members from talking to each other. Yet we do. 4. Create a predictable process for grass roots suggestions to bubble up to the CC and Validating Council (VC). We cannot preach democracy and yet practice democracy-as-a-vote. Yet we do. DiEM must implement a simple, clearly-defined process that starts with the public expression of members’ concerns that reaches all members and leads all the way to a vote on the subject if there is enough support from the membership. Currently, a member doesn’t have a way to start a petition, make all members aware of it, and if there’s enough interest have it openly debated by the CC or voted on by the VC. Even the UK Government has a similar process. Surely DiEM can do better than the UK government. We cannot preach transparency while staying opaque. Yet we do. All communication should take place in the open. Finally, we cannot criticise everyone else but hold ourselves and our own members and associates above criticism. Yet we do. This brings me to the last drop that made me decide to leave DiEM. I simply cannot continue to be affiliated with this movement as long as criticism of certain people within it is taboo. I’ve always been uncomfortable with Julian Assange being on the DiEM25 Advisory Panel. While I appreciate his original service along with the work of many others – both inside and outside of Wikileaks, and while I wholeheartedly believe he must be released from what the UN has called arbitrary detention, I simply cannot condone his recent behaviour over the past couple of years. That includes his support of Brexit, his collusion with Trump’s team, his ongoing attacks on feminism, and now his attacks on a stellar journalist, Carole Cadwalladr, who has done an amazing job this year to expose the links between Surveillance Capitalism and the far right. Those links, for Assange, apparently hit too close to home. DiEM has, to its shame, failed to publicly criticise Assange or distance itself from his words and actions on all of the above. I’ve voiced my discomfort from the beginning, both openly on Twitter when I first joined the Advisory Panel myself and later, multiple times, internally. Whenever I brought it up, people looked uncomfortable and it never seemed to be the right time to have that conversation. Julian Assange seems to be the elephant in the room at DiEM. A little while ago, following another public attack on feminism (this time an attempt to shame men who identify as feminist), I called it out publicly on Twitter. I should have done it sooner. The only reason I didn’t – I’m ashamed to admit – was that I was scared of the fallout. Assange has a vocal following of alt-right Brexit and Trump supporters as well as very devoted friends in our circles and I feared the repercussions. That alone should be a red flag. Should we be associated with people we are afraid to piss off because of what they may do to us? That was my failing and I apologise for not speaking up sooner. So I compared Assange’s words with Yanis’s from an interview where Yanis stated “I am utterly a feminist in my disposition.” I also pointed out that DiEM prides itself on being a feminist organisation. I asked how this is compatible with the words of one of our advisors. I asked why we were not criticising his words or distancing ourselves from them. We cannot preach feminism and yet continue to uncritically support members and associates who malign it. The response, publicly, was that I had misread his tweet. The response in private (to the CC) was that I was being “uncomradely”. I was asked to stop talking about this publicly so we could have a private debate. I was subsequently also told privately by a CC member that no debate would happen because DiEM was being helped by Wikileaks and that Assange was “emperor” of Wikileaks. The point being that Assange, as emperor of a powerful and useful ally was beyond reproach. This is not just unacceptable, it makes me extremely uncomfortable. My goal is to work towards a world without kings and emperors, not to help elevate new ones. I am uncomfortable in any group where anyone is above reproach. I find it exceedingly difficult to separate such a group from a cult. Now that DiEM has an electoral wing (which I think was a positive and necessary move), what happens if DiEM gets into political power? Does Wikileaks become its own little NSA? Via proxy of Moscow perhaps? To be honest, I don’t want to know and I don’t want to be involved. I was asked, privately, if I was devoid of empathy – could I even imagine how being imprisoned in an embassy for over five years might affect me. To be honest, I don't know. I would hope that if the effects were that I started speaking out against feminism and amassing an alt-right following through my words and actions that my true friends would stage an intervention. That’s what the me of today would want. What I do know is that it’s possible to oppose Assange’s arbitrary detention and criticise his current stance on topics ranging from Brexit and Trump to feminism at the same time. Also, I know of someone else who played a pivotal role in the leaks, went to prison, and spent time in solitary confinement and has not come out the same way. We should perhaps ask ourselves why not. It might be worth considering whether Chelsea Manning should be on the Advisory Panel instead and what a different message that would send out about the values that DiEM holds dear. But this is not about Julian Assange. This is about DiEM. It’s about the culture we want to encourage at DiEM. Is it one of fear of public debate and self-criticism? Or one that embraces them? It it about radical transparency and decentralisation or are we creating yet another centralised power structure? The 7th pillar stands for free and open source, decentralisation, transparency, and openness. I’ve had my efforts to implement those principles internally at DiEM rebuked at every turn. As such, having a 7th pillar at DiEM doesn’t make any sense to me at this point. We are not practicising what we preach. And I cannot continue to be part of DiEM as long as certain people are beyond criticism and certain topics are taboo. DiEM25, today, is a Yanis Varoufakis fan club with 60,000 members. That’s perfectly all right; every movement has to start somewhere. However, if it is to be more (and it deserves to be more) then it must leave its fear at the door, embrace radical transparency, openness, and decentralisation. It must exist to create the decentralised platforms that would make its centralised governance model unnecessary. Far from encouraging a cult of personality, it must exist to not exist. I do hope that the DiEM25 CC takes this as intended. In my view of friendship, a friend is someone who speaks an uncomfortable truth to you because they care. (Even when ignoring the topic would be infinitely less hassle.) Please consider this an intervention. I don’t care about how unpopular this may make me in certain circles. I do care that I do everything I can to make sure DiEM has a chance to critically analyse its culture and make amends so that it can achieve its potential. That potential is great. Please do not let fear keep you from it. Sometimes the hardest thing you can do is to remove yourself from a place and the people you love. If this sparks a crucial debate within DiEM, I will know it has been worth it. With hopes that this is farewell and not goodbye. Update (Dec 31): DiEM’s reply (PDF). Seems I wasted my breath.